Sorry to steel (sic intended) a title but it’s about as perfect as this title could be. I take pictures of almost everything I build. Some see the light of day but most do not. I have a deep connection with building things for my own satisfaction so documentation is rarely on the front burner. I did this particular frame as an experiment. 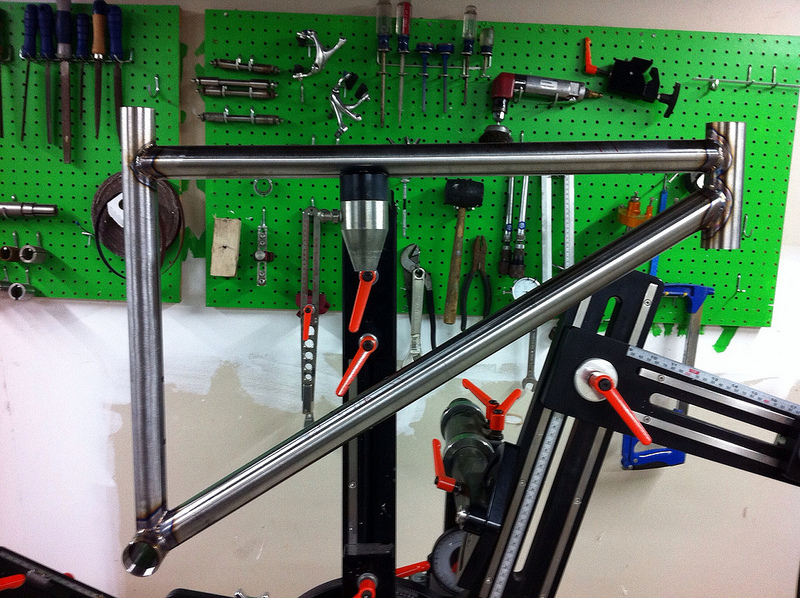 I had been talking to a local MTB racer about building a race frame. We’ve gotten to know each other over the last 6-9 months. He’s an excitable guy. The type of guy that holds the door for little old ladies, says please and thank you, and just checks in once in a while with a pleasant “how is it going”. 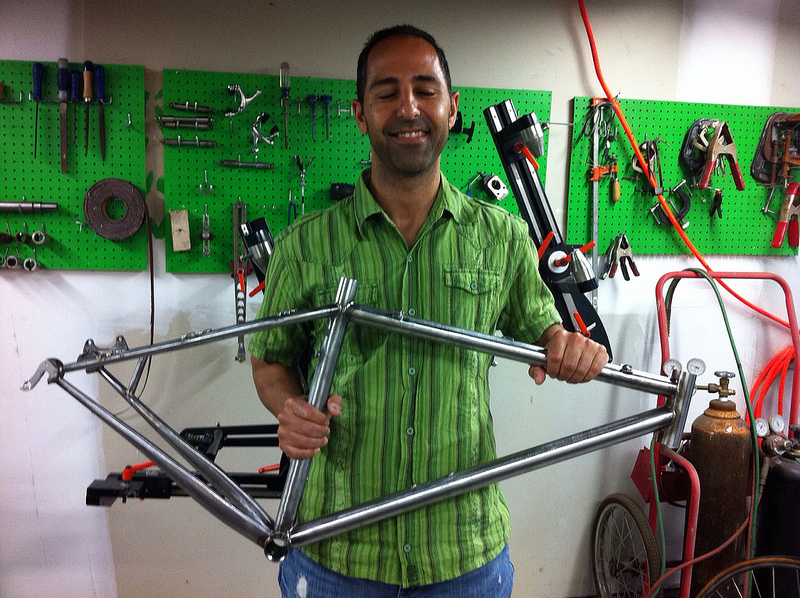 I like building frames for friends and people who are positive about the world. I don’t have an unlimited number of these in me every year so it’s professional nirvana to be in this situation. It’s my goal to stay in this state. I had been planning to start a really cool build for an expedition style bike. 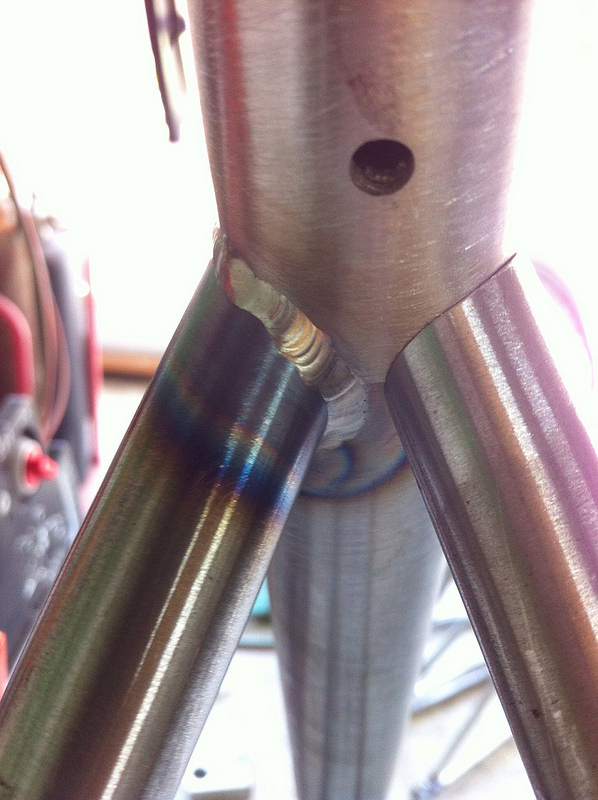 It’s taken a little longer to get the parts than I thought, so with a few days extra time I plugged this frame in the queue with the idea of documentation, but also to see how fast I can weld a bike with keeping the quality high. 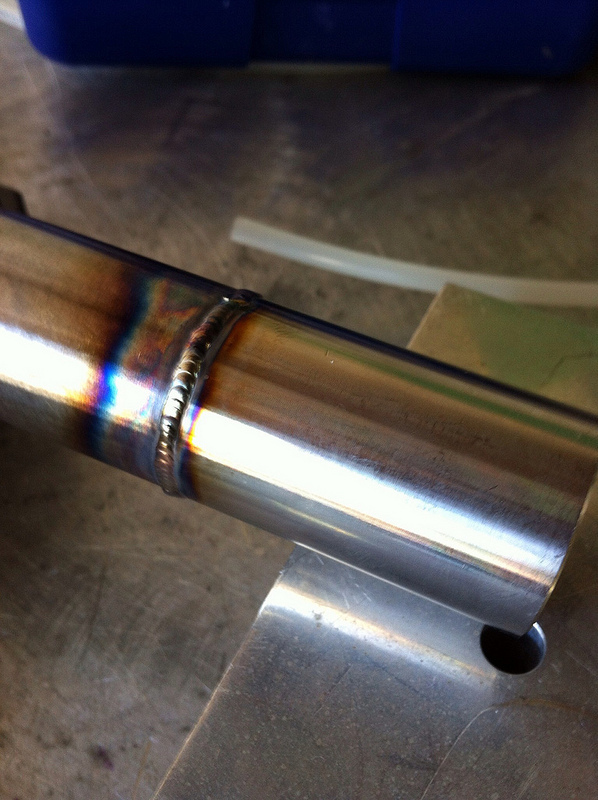 I have been welding in larger batches that take weeks; this was about doing it in hours. Last Thursday I started cutting tubes at 3pm, had a fully built frame 22 hours later, and a deliverable frame 48 hours after that, I hope you enjoy the pics and the process below. The pictorial is purposefully incomplete but I think it shows my general technique. The biggest part of the first few steps for me is to miter the tubes. 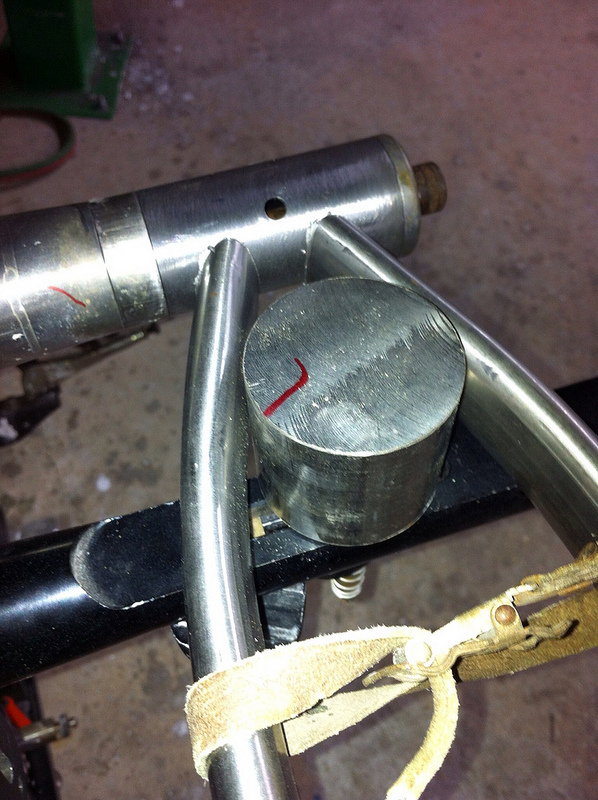 The tight alignment shown below helps keeps the tubes straight once I start welding. The heat of the torch arc and the molten filler will pull any small gaps in an attempt to close them. 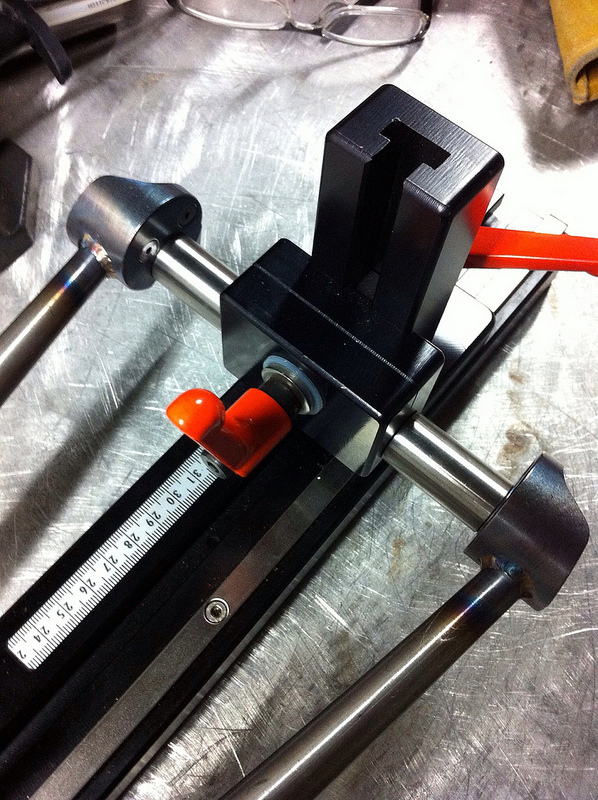 While misalignment can be corrected in several ways the best thing to do is minimize the gaps altogether. 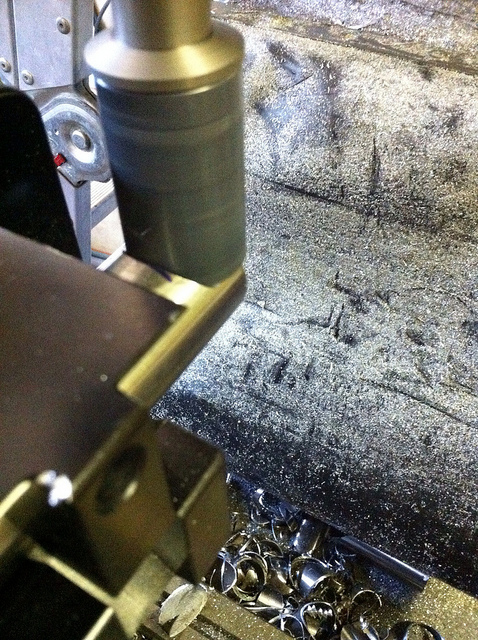 The process of cutting the tubes involves my knee mill. Keri likes to call it my 3000lb drill press. 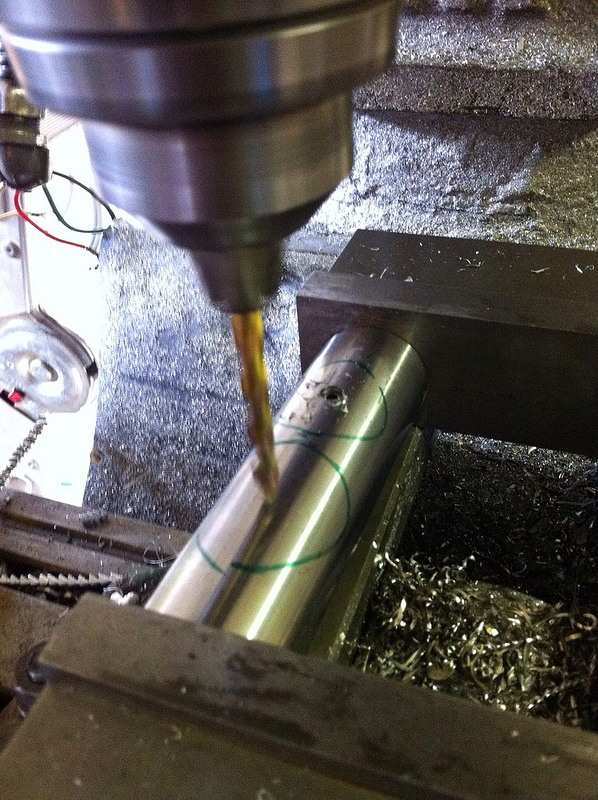 I have fixtures designed to precisely hold the tubes on center and at the perfect angles for the cutters to do their magic. Once all of the tubes are mitered, I set up the fixture and see how tight the tubes fit and what adjustments need to be made. There is lots of measure twice and then twice more and cut once going on. 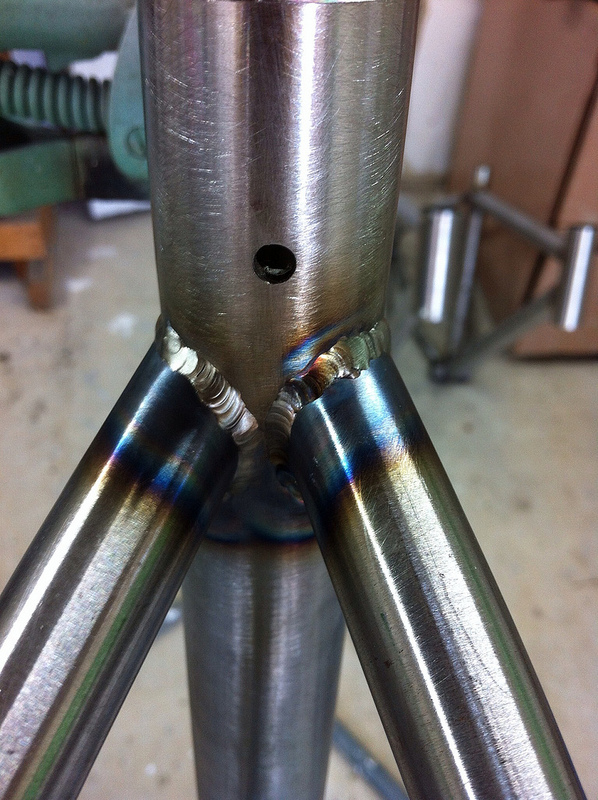 Once everything is tight I go through a process of drilling holes in the head tube and Bottom Bracket to allow the hot gasses to move out of the tubes when they get welded and to allow argon to flow through them to keep impurities from becoming part of the weld. 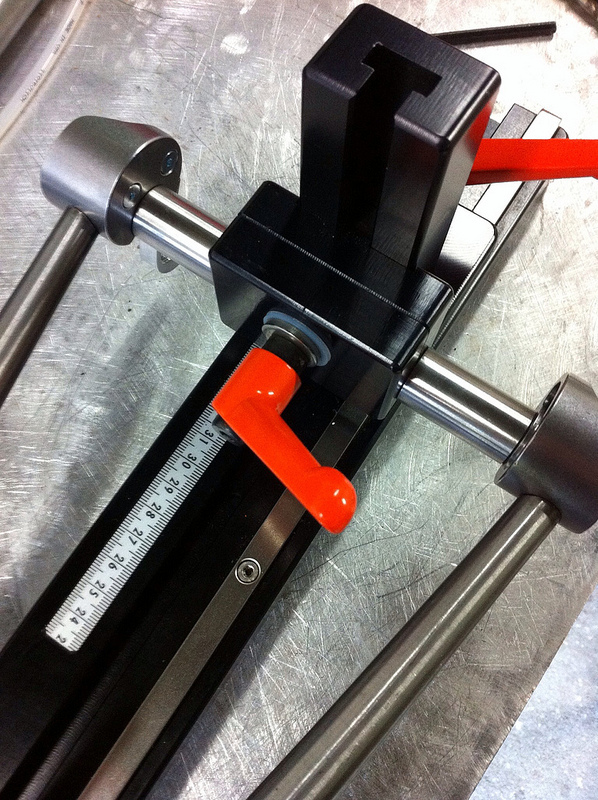 The next step is an option that allows the use of a 27.2 seatpost in a 31.8 tube without a shim. 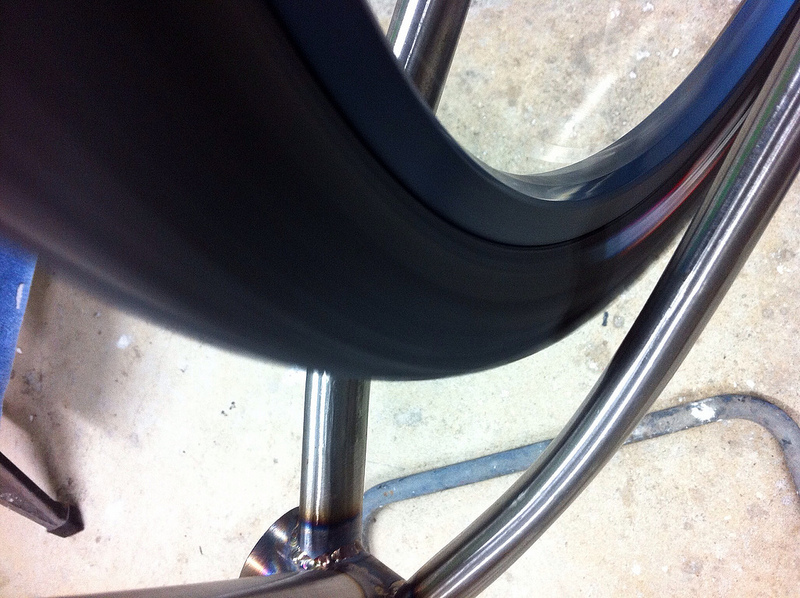 I weld a stepped collar into the seat tube with an internal 27.2 bore. 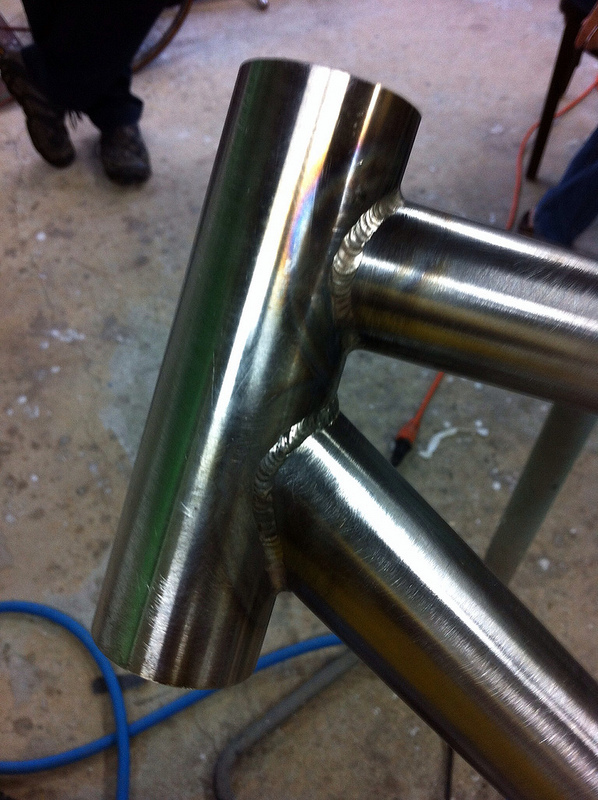 I then file down the weld and sand smooth. 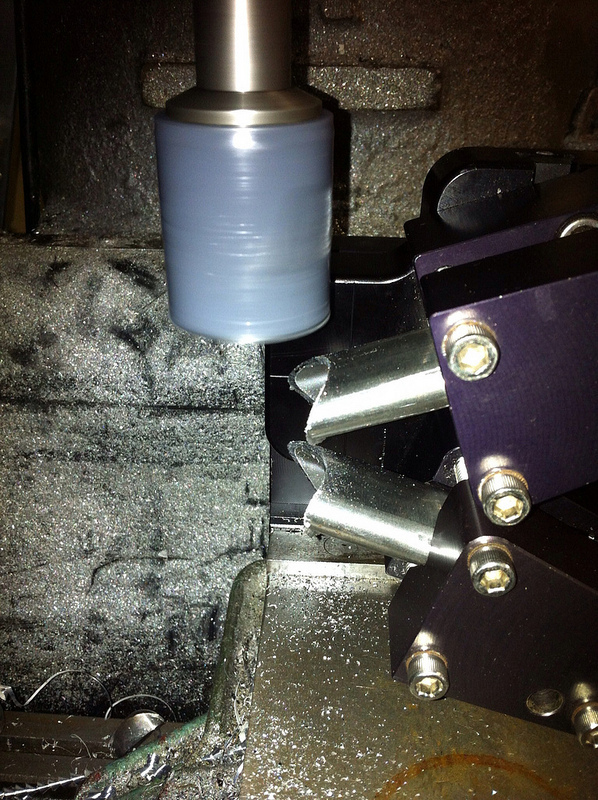 the effect is that you can’t see the junction between the tubes other than a small line of welding filler. Now that the front triangle is mitered I move to the chain stays. I assemble the stays and drop-outs into the mitering fixture to locate how I want everything to fit. 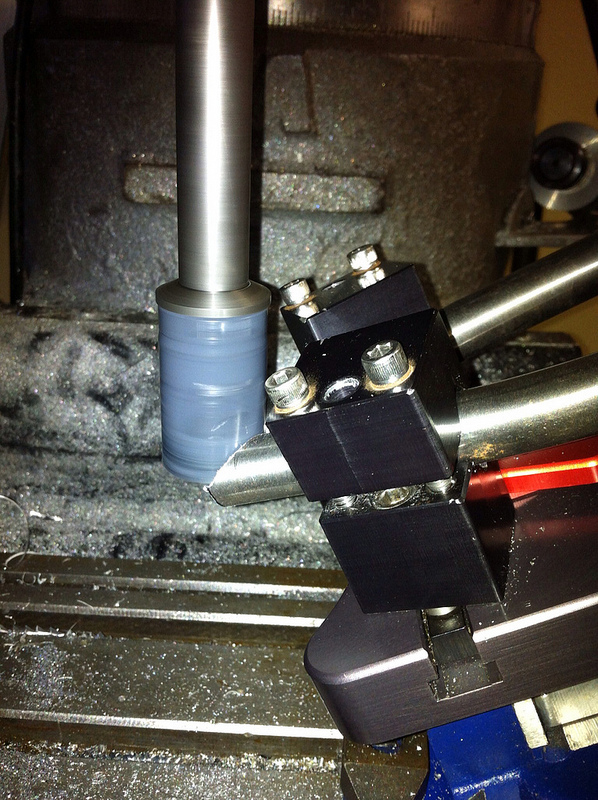 The dropout end of the chain stays get the first miter, done by hand with a file whose profile matches the dropout. The goal as always is a tight fit. After the mock-up is done I weld the drop-outs on. The welded sub-assembly is now carried to the mill and mounted in the vise and the chain stays are cut at angles to fit on the bottom bracket to maximize tire clearance but still leave room for the chainrings. At this point I head back to the fixture and make sure the stays are the right length. 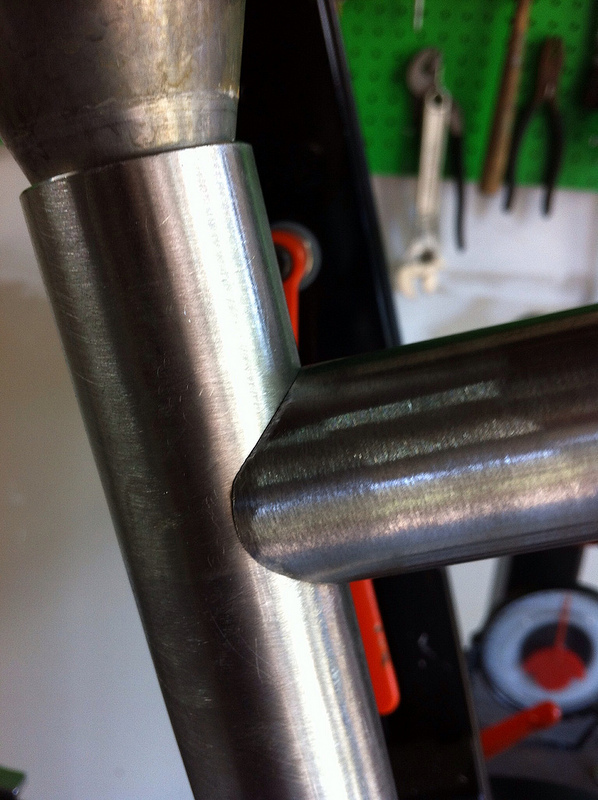 Mitering is important here because any gaps will tend to pull the wheel left or right, compromising alignment of the rear wheel. After I’m satisfied with all fits it’s time to tack and weld. The first thing I do is tack in two or three locations on each tube around each side of 6 or 12 on a clock face. The tacking and welding is done in such a sequence to pull the frame out of alignment as little as possible or even to pull it back in if necessary. 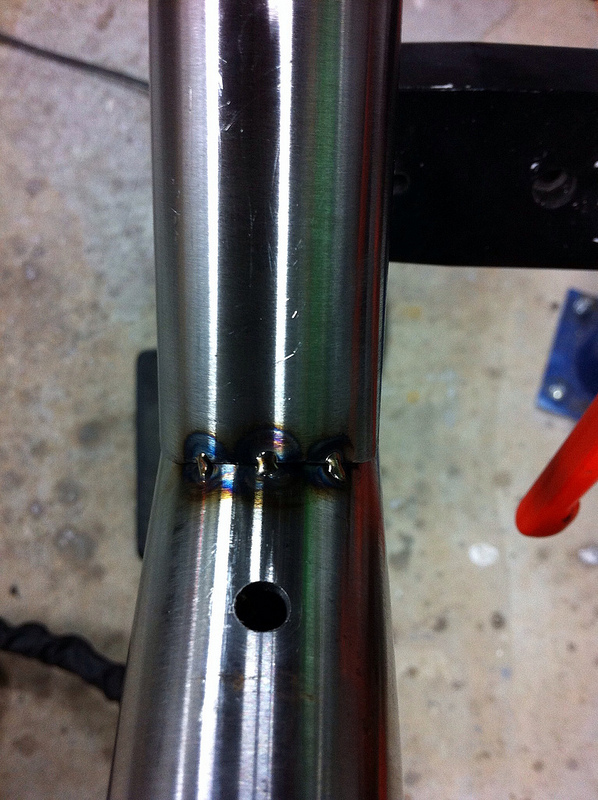 After the frame is tacked I’ll weld as much as I can in the fixture. The range of motion is limited so after welding in the fixture I’ll finish up on the welding table. This is the table shot of the BB. What’s missing is the wider view of the fixture adding argon to the inside of the tubes to create an oxygen-free welding environment. 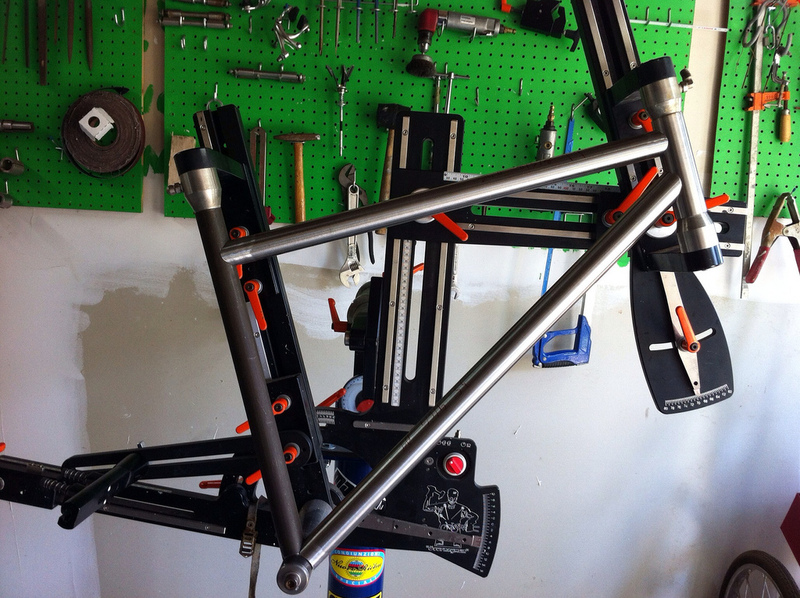 This is where things stand after welding the front triangle. The next step is to weld the chain stays on. 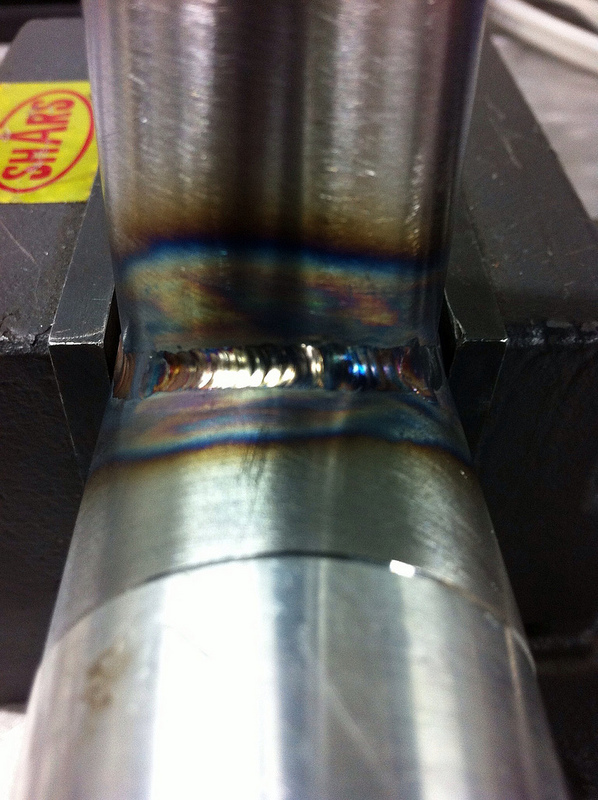 Getting the drop-outs to stay the correct width again requires a sequence of welding certain parts of the tubes first. The goal is no coldsetting, and for the wheel to sit center. Much proper care was taken in earlier fit up to have the chain stays bend at the widest part of the tire. After chain stays it’s time to move on to seat stays. 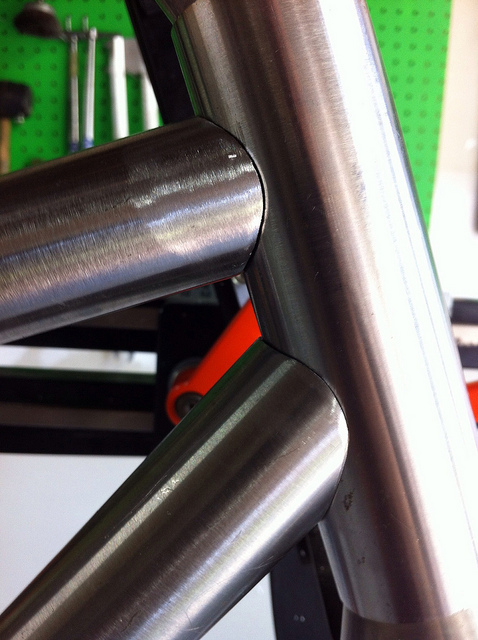 I first load the stays into the mitering fixture at the desired spacing and angles. 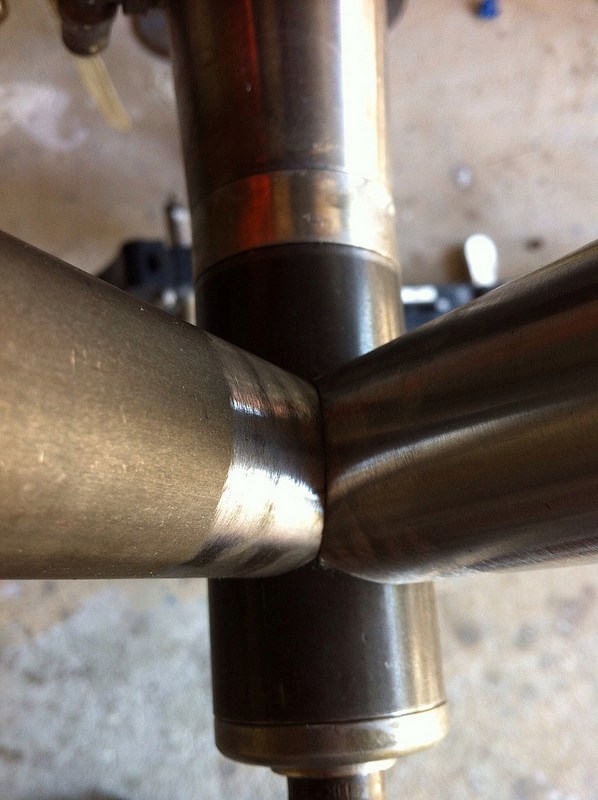 After mitering I fit up and miter the drop-out end of both stays and weld the first stay on. The little bobble in the filler still bothers me. The next part you don’t get to see. 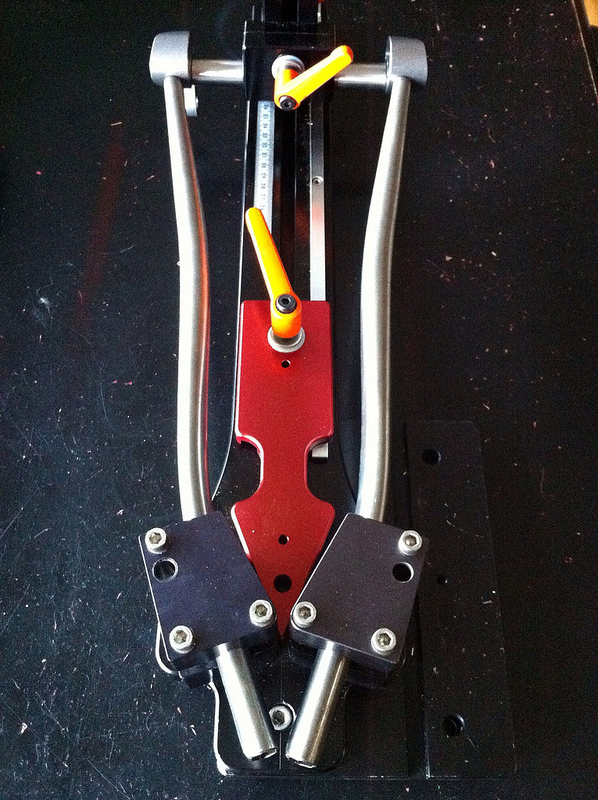 It’s a lot of little tedious work like doing the bridges and braze-ons. The good news is that sometimes the client shows up at quitting time with some beer and Keri shows up with more beer and we have a great time. Sorry, no steps of the paint process. The elves are pretty elusive. All I do is leave the can of color coat on the bench and they do their thing in about 24-48 hours. It’s pretty cool. 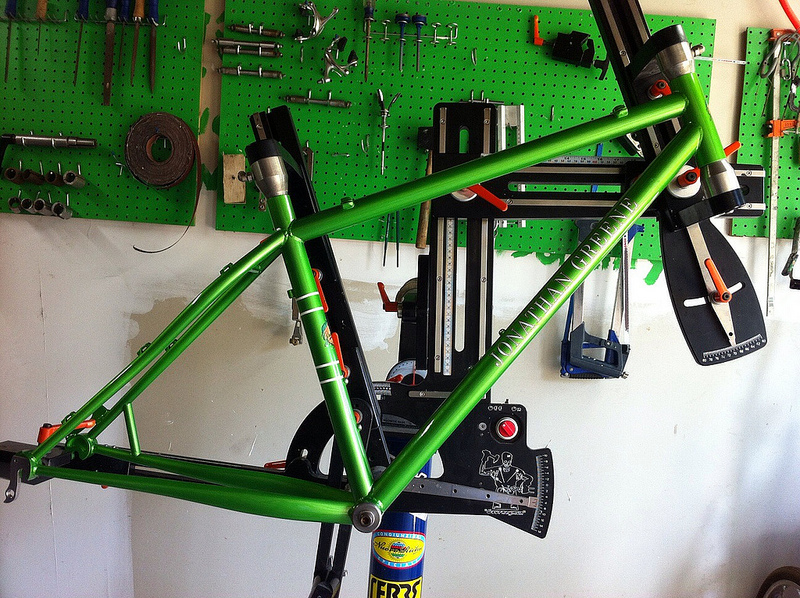 This is the first of a string of bikes that will be limetime. It’s amazing to me how when one person sees a color, others like it too. My middle son picked the color and it seems to be a hit. If you scroll back in time on this WordPress site you’ll see I swore off green, oops. I hope you enjoyed the tutorial. It was a fun frame to build. Ciao! Some blog posts way back I mentioned I’d like to have an event centered around my brand. It was loosely conceived that a group of like-minded friends, pals and associates would get together and ride for a week. And to be honest, the idea was not all that original, it was lifted straight from pal Steve Hampsten. His Retiro training camps in Central CA looked pretty awesome. My version would be based out of Gainesville FL, maybe the only unique university town in FL. Well, it went down last week. I started small, with a couple of good friends from Boston(DavidS and wife in forum speak) and Tootall with Queen. At different times we had my bro, my Dad, Redmist and the better looking but less good with tools Fazzio brother. I must gush about how awesome everyone was and the time we had. The riding in and around Gainesville could be top five in the USA for the month of February. It’s that good. Everyday we could have chosen loops between 40 and 100 miles and not seen many of the same roads twice. The friendship was good too. Youz guys (if you’re reading this) made it special, and who would have known Sammy Hagar’s Tequila wasn’t bad? At this point I’d like to commit to this happening again next year and the year after that. If you’re a pal, are like minded, or just want to ride bikes, get in touch with me and I’ll put you on the list. I’ll work out the details later in the year, but it’s a sure thing. When I started this blog I wanted it to be about bikes, my frame building, bike racing, and my involvement with all three. Being a political person it was a real line in the sand to keep politics off a place I share opinions, and I’m opinionated. Something has happened recently that I feel strongly enough about to cross that line and share what I believe in, even if it alienates a future client. I’m going to share my thoughts on Treyvon Martin because he’s local, and I don’t mind associating my brand with my opinion if it can maybe do some good. I’d first like to share some thoughts about one of the towns I call home, Sanford FL. I’ve spent 36 of my 41 years in Seminole county, a small very homogenous county of which Sanford is the county seat. Of those 36 years I’ve only had a Sanford address for 6 months, but I’ve had an office in Sanford, I have clients in Sanford, and I participate in civic events as well as shop and dine there. It’s a lovely town on a beautiful lake. It’s a great small town in many ways. Sanford is also like many Southern towns with its small commercial district struggling with revitalization and gentrification while its outer perimeter keeps growing with strip malls and big box stores. 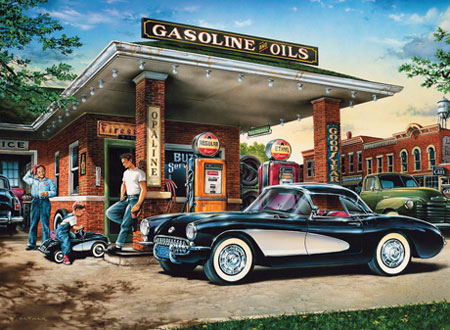 The old timers struggle with how to manage growth and maintain the status quo while outsiders move in and dilute their power and threaten what they see as their way of life. Sanford doesn’t like to change much. Sanford also has a not so unique Southern history of Racism. In 1985 I picked up Peter Golenbock’s book “Bums” about the history of the Brooklyn Dodgers. This is where I first learned of a story I didn’t know about where I live. When Brooklyn Dodgers GM Branche Rickey sent Jackie Robinson to play in the Florida Minor leagues he thought it would be a safe place for Robinson to play before he entered the Majors. FL was not the deep South. Nope. While many communities forbade Robinson from eating at restaurants and staying at motels because of his color, Sanford went as far to refuse him the ability to play at the Municiple stadium when a group of local resident went to the stadium and put a stop to Robinson’s game. That’s really not that surprising here in the south. My current home town of Oviedo filled in it’s community pool with dirt in the 70’s rather than let African-American kids swim in the “white pool”. The law couldn’t desegregate a pool that didn’t exist. By the time I was in school things had changed. Racism wasn’t blatant and certainly It’s not like that today. Laws have been passed, generations have changed, and we’ve learned that color is really only skin deep. While it wasn’t uncommon for me to hear the N word as a child, it was still considered a bad word. The good news is that I don’t believe my children even see color. I’ve watched how they approach other kids at parks and playgrounds for those subconscious reactions and I’m grateful they’ve grown up the way they have. Kids seem to be just kids to them. And then comes Treyvon Martin who’s death exposed what’s always been under the surface the whole time. There isn’t a bone in my body that doesn’t believe Treyvon wasn’t hunted down and murdered. He was judged and executed by one man without a badge or gavel who had his own version of justice. A black kid walking alone with a cell phone was reason enough for Treyvon to be considered suspicious. Because of his color he was obviously about to commit a crime and “they always get away with it” according to George Zimmerman. He had to be a drug dealer or theif, he was wearing a hoodie, right? Maybe George Zimmerman is part Hispanic, maybe he doesn’t hate blacks, but Martin’s skin color and relative age led to a presumption of guilt and that’s the most sinister form of racism. Martin’s skin color was also the reason Sanford police took Zimmerman’s word on self-defense and didn’t start any kind of investigation. Could there be any other reason why they didn’t consider the 911 calls or testimony of people who lived at the crime scene. They blamed it on our gun laws, but the law does not let you track another person down and kill. The state attorney reviewd the evidence and determined he couldn’t convict. Is that because a jury would think it’s reasonable for a black kid wearing a hoodie was up to no good? It’s been that way in Sanford and with with the Sanford PD; they didn’t stand up for Jackie Robinson when white resident took matters into their own hands and they didn’t for this kid. Martin’s skin color is also why the old-time residents of Sanford want this to just go away. This kid was not important enough. I’m hearing some say this is a travesty and they want justice, but only as they also say that most residents of Sanford are good folks and the city doesn’t deserve this and the police chief is a scape goat. They ARE good folks and the city as a whole DOES NOT deserve this but I can’t get past the relative severity of a murder vs. some media attention. The Police chief is not a scape goat, he’s the Chief. I too cringed when I heard that Rev Sharpton was coming to town. I think his visit held more potential for trouble than it could help, and especially now that the justice department and FDLE are involved and the Governor has appointed a new prosecutor. I can also say that if Martin was my kid and he was murdered, and it took 3 weeks to get the authorities to listen I’d welcome anyone speaking for me that could help. What’s so threatening about a rally in the aftermath of murder? The Sanford police, city officials and state prosecutor are responsible for the media attention, not the press and Rev Sharpton. They thought this was business as usual and it could get swept under the rug. It’s clear I feel strongly about this. When I heard the president say the other day that if he had a son he’d look like Treyvon Martin I said to myself I do have sons and I’m outraged because they could be in Treyvon’s shoes too, but it’s a simple fact that my kids look as white as wonder bread and that gives them certain advantages like selling school items door to door, applying for certain jobs and walking down the sidewalk without looking suspicious. I may not like to admit it but racism is alive and well where I live and it took the life of Treyvon Martin and it kept him from recieving his due justice. I don’t feel much sympathy for Sanford on this. Sanford has always been a place where the connected got special treatment and it’s wrong. It’s a good lesson to learn for other communities that if you don’t change from the inside, you’re susceptible to drastic change from the outside and it can rip your town apart. The other problems through the years with the Sanford police never got this kind of attention and change never came. Because of Treyvon Martin, I don’t think Sanford will ever be the same, and that’s a good thing even if there are no winners. If your town or city is like mine there are cyclists everywhere. When I started cycling on the road, the Florida Freewheelers were the major club to join. A few bike shops hosted rides but the big and fast rides were with the Freewheelers. Times have changed; they are a more mellow group now, but other groups have popped up to fill that void. It’s not uncommon to see over 100 riders start at the 3-4 big groups that now meet. There has never been a better time to be a road cyclist. One thing I do notice is that you can spot a new rider pretty easily by how their bike is set up. I’ve never seen as many upward sloping stems, bars as high as the saddle, knees sticking out, etc. I understand why its that way. It’s better to get folks onto bikes than not, but there is a huge market for followup advice in my opinion. As these riders get better we should be encouraging more efficient positions to make for more efficient bicycles and better experiences. How many times have you heard a new rider say their saddle is no good? They usually buy another and another until they find one they like. The one they like, usually is the one they are sitting on after a few thousand miles. I don’t think it’s coincidence. Everything changes with miles in the saddle. Set up should be like that too. To keep these riders happy in the sport we should be coaching and teaching good longterm habits after they get past their first few thousand miles because that is where fitness and efficiency starts to happen. I think if more bike shops thought of and sold fit as a process rather than part of the sale they’d build more and more long-lasting relationships and that would be good. A fit process would add more value to the sale. As our economy continues to transform, there is less and less reason to walk into any retail space, much less a bike shop. Give consumers another reason to come back for a sportier helmet, clothes shoes and gloves. Most of the shops I know offer “free tubes for a year” or something like that. Those are nice gimmicks. I think a reassessment of your fit after 6 months and 1 year would be more instructive and actually profitable. That’s what you pay for with a CPA, Financial Advisor or an Attorney. Why not? 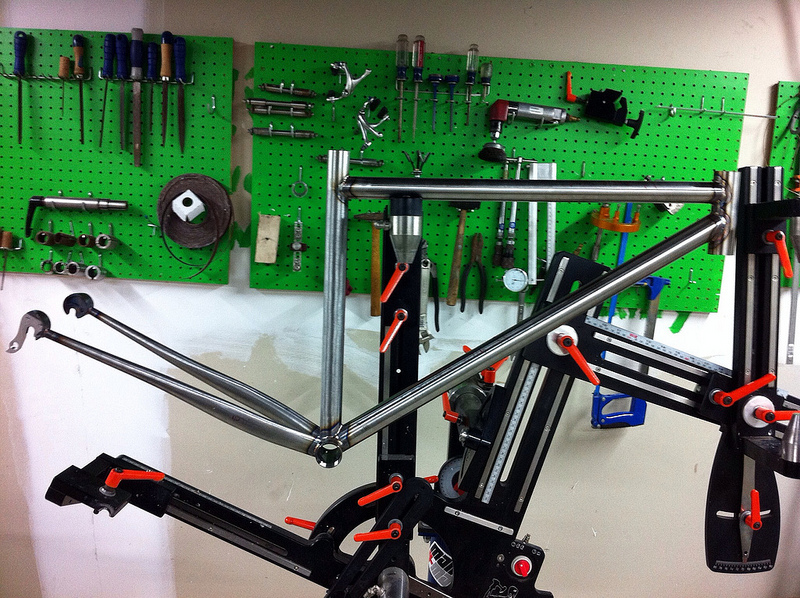 I’ve only built frames for people who have many thousands of miles on the road and mostly know what they need. These are racers, for the most part, or performance riders, but if a newish rider wanted to have a frame built and bicycle assembled I’d love the opportunity to do that if long-term fit were part of the discussion. Buy a bike and I’ll work with you as you change and get stronger. I’d like to put Full Service back into service.